Dogwood Trees - Top Tips For Planting And Maintaining! Nothing quite says Spring is here like dogwood trees blooming! The beautiful blooms of the dogwood tree. Dogwood trees are well-known and revered for their beautiful pink, white or reddish blooms in early to mid-spring. The blooms can last for up to 3 or 4 weeks, signaling the start of the summer is just around the corner. Their showy blooms give way to beautiful green foliage on sturdy, well-defined limbs. In the fall, leaves turn to beautiful hues of red and purple. They even add interest in the wintertime with their gorgeous limb structure. Some species even produce red berries that bring even more color to nature’s pallet. Dogwoods, native to the Eastern portions of the United States, are a wonderful addition to the landscape. Once established, they require little long-term other than minor pruning and shaping. Dogwoods perform best in partial sun, although they can survive in both full shade and totally sunny locations. They require a fair amount of water, so locating them in partial shade is a better option for best success. Dogwoods also benefit from a little protection, whether it be from other trees, or structures. The best time to plant Dogwood trees is in the early fall or spring. They can be planted from bare root, or from potted root balls. If you are planting bare root stock, you will definitely need to plant in fall or early spring, before the tree begins to bud and flower. Dogwoods planted as root ball trees can be dug in at any time, but the spring and fall are still better, providing less stress on the trees. 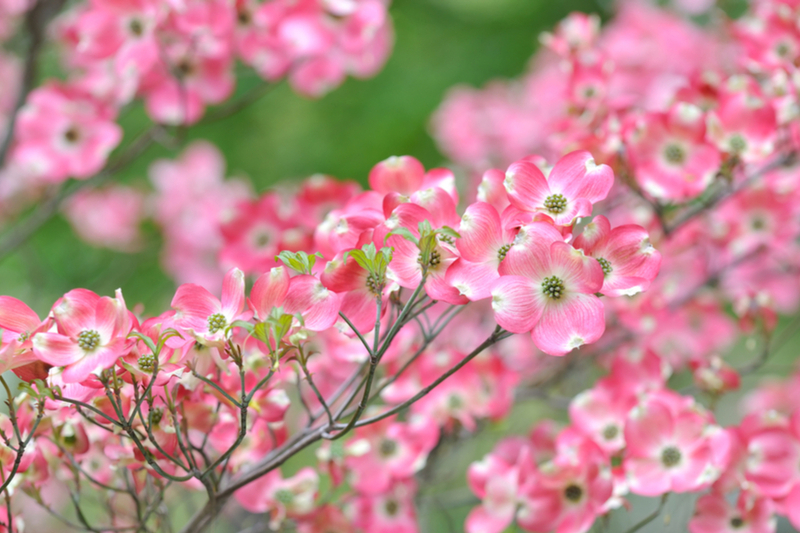 Dogwoods prefer rich and fertile ground to grow strong. Amend planting holes with a 50 percent mixture of compost to soil. Dogwood trees should have their crown set slightly above the soil, not below. When planting, set the root ball in the hole, and be sure the top of the root ball is about 1/4 above ground. Water the tree thoroughly when first set in the hole, and then again after planting. Mulch can be used around the drip line of the tree to help retain moisture, but take care to keep it away from direct contact from the trunk. Newly planted Dogwood trees need to have regular watering during their first full year of growth. Water ever week or two during the first growing season. If it is extremely hot, or you have long stints of dry periods, you will need to water more frequently. Dogwood require little long-term care. Prune back any dead or diseased limbs as needed. For all additional pruning or shaping, remove limbs and suckers during the summer. This helps to eliminate removing potential blooms in the off season, and keeps the sap to a minimum. Dogwoods heal over quickly from a pruning cut in the summer, but in the cool months, they can bleed sap for a long period. Share Your Garden Or Advice With The World! Growing Popcorn – How To Easily Plant, Maintain And Harvest!